I don't know quite why (!) but I decided to use the remains of a top note cut-out to use as a mask which I held over my card base while I sponged a background inside with So Saffron and Old Olive inks. I've used my favourite Confetti card stock with those beautiful speckles in it. The white flowers from Greenhouse Garden were stamped on top of this and embossed with white embossing powder. I really like the misty look of them! The stalk from the set was added randomly in Old Olive and then came the Nature Walk plant, which I coloured with Daffodil Delight and Old Olive markers before stamping repeatedly. To finish I defined the white flowers with markers and added a sentiment using my stamp-a-majig. This was one of those cards which started with me wondering what would happen if I just... and then ended up like this! Can you believe it's Friday already? We have a packed programme of cricket, shopping expeditions, summer fairs and tennis tournaments scheduled, so fingers crossed for the weather! I hope you have a lovely weekend too, whatever you have planned. Thanks again for all your support - I really appreciate my followers, your visits and comments, and hope to see you here again very soon. This is just beautiful Vicky. Vicky, this is lovely! I have not thought to sponge ink in the background! Love how you used the top note die as a mask! Very lovely, Vicky, you layer your nature scenes so well. I hope you have great weekend, weather and all. I always have difficulty with inspiration challenges. I'm never quite sure what I should be inspired by! I love how you've interpreted this challenge. The embossed flowers are perfect! This is so beautiful. 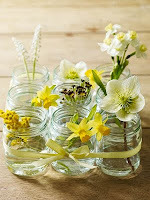 Great idea to emboss the flowers. Before I read how you did it I thought they were paper flowers you glued on. Great job on the challenge. I've been going to do it but have been making some other things. Oh my word wuat a beautiful card, it's just stunning and gorgeous. I love the colours and the technique you have used. What a cool way to use a mask! Beautiful card you got there! Wow!!! I had to look twice - there's so much depth in your card - hard to believe it's just one layer. It really is stunning! Vicky, the depth you've achieved is phenomenal! I love those blooms...and they do look like they were added on top of the card...but I can see that you've created a little shadow which gives the depth feeling....WOW! Simply AWESOME!!! Loved your card. Yous certainly captured the feeling of this challenge. Thank you for commenting on my card. I appreciated it. Great take on this inspiration! I love those creative white flowers! Hope the weather cooperates and your weekend is wonderful! Simply terrific. Lovely card from the inspiration provided. Beautiful card, worth waiting a day for...I love the masked background. Oh dear I only popped by to see the French Foliage stamp in use again what will I do !!! ( just kidding ) Beautiful work foliage or no foliage love your sponging and stamping and so so pretty. Just going to check out ebay to see if you can by the bomb ingredients lol. Have a great weekend sounds like you have loads planned. WOW!!! What a gorgeous card. Your layering of stamps and colors is just fabulous, Vicky. I love it. Absolutely STUNNING!!!!! Do you mind if I borrow the idea to use the Top Note template for sponging in my series on Top Note ideas on my own blog? This is sooooo beautiful!! 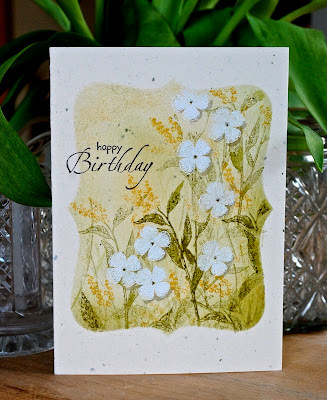 LOVE the stamping, the set you used, the colors...framing...love it all...what a lovely card:)!!! !